Last week, I posted a snapshot of my clipboards on my instagram account. Just a crazy, simple shot to encourage you to make your walls work for you by hanging a few clipboards around! And I was amazed at your responses and interest! 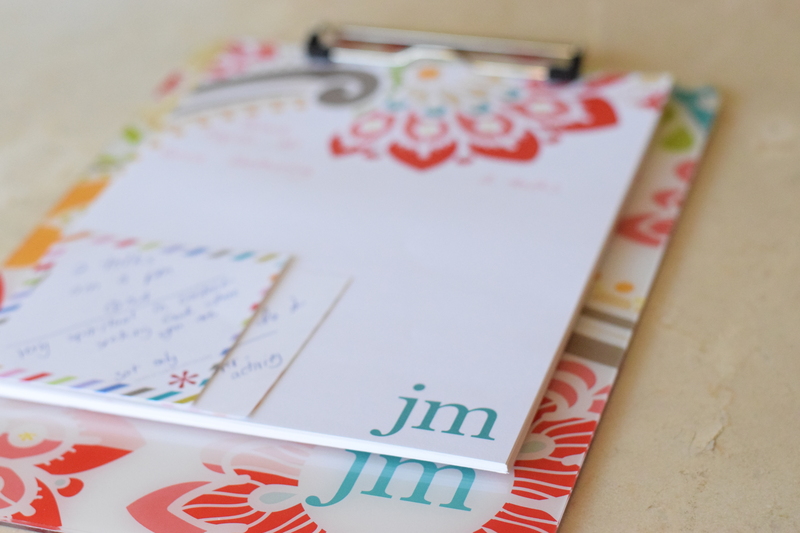 You LOVE those crazy clipboards and you asked me to share more about them – so…here you go! A little clipboard LOVE! 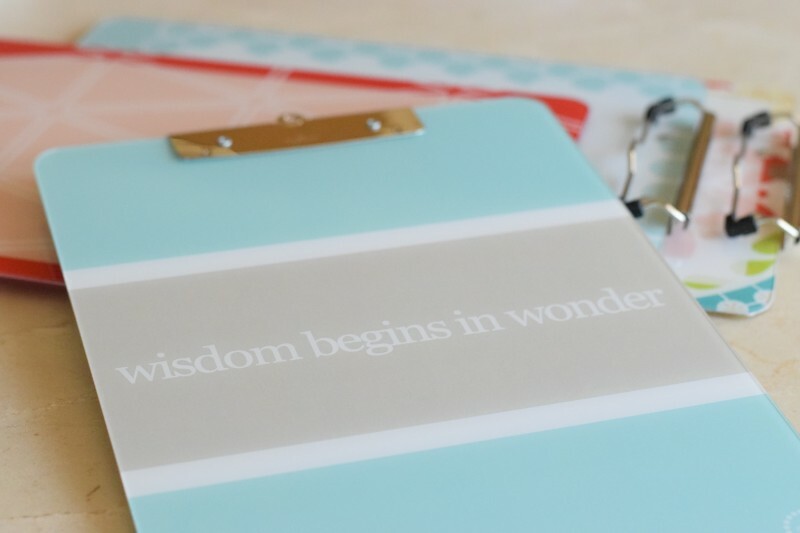 You all probably know by now my love for Erin Condren through my many planner review posts – her products are visually striking, fun, AND many of them are totally customizable! And they work hard – which makes me a fan! All my clipboards are customized with colors, initials, and various quotes (or you could add your name). prism clipboard in red with white pattern – oh my goodness, I love how the red pops on this acrylic clipboard! 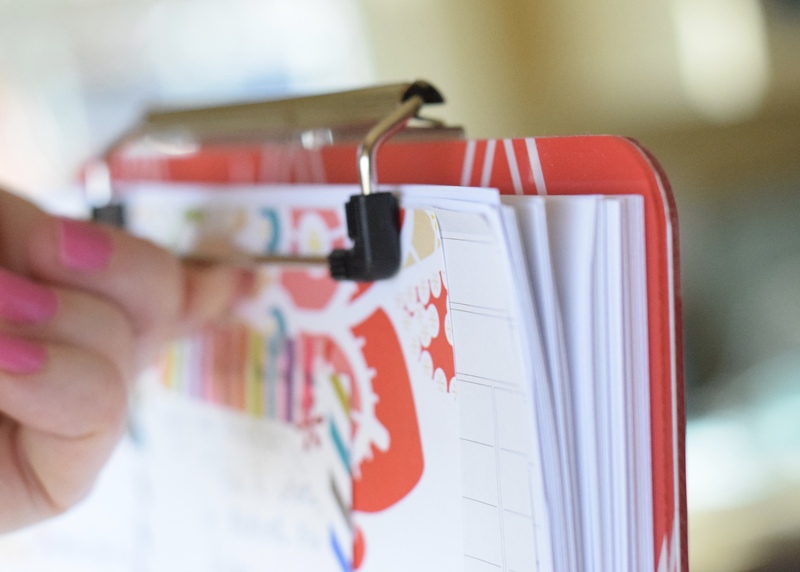 The clipboards have a heavy duty clasping mechanism that holds a lot of paper in place – even when the clipboard is hanging up. You can see how much paper I’ve got on this clipboard…yet when I hang it up, nothing budges! 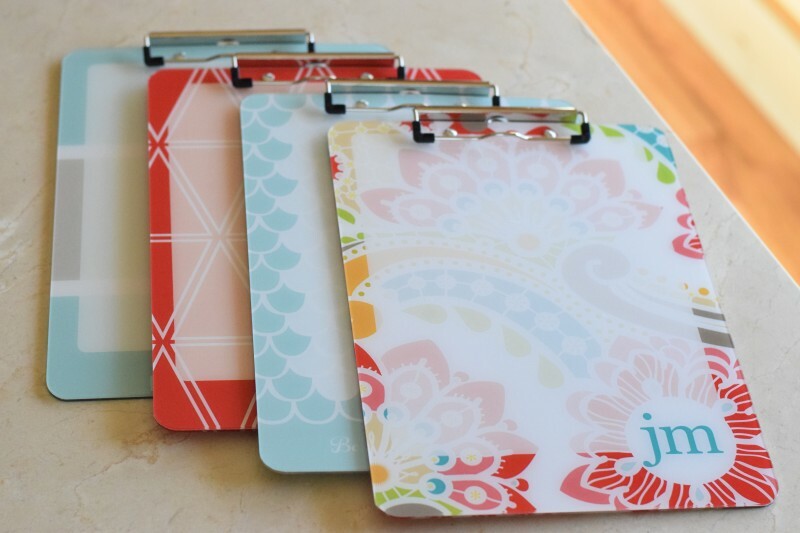 Each of these clipboards functions as a different landing space for me. It’s right in front of me as I sit at my desk and gives me a quick mobile platform to work with – I can grab my laptop and my blog clipboard and settle in on the couch for a little blogging…or my home clipboard and my planner and my cookbooks/recipe notes and sit at the island for a little menu planning. My taffy clipboard is for the good stuff I find online that I want to read or brainstorm – the good, true and beautiful. Anything faith based lands here. 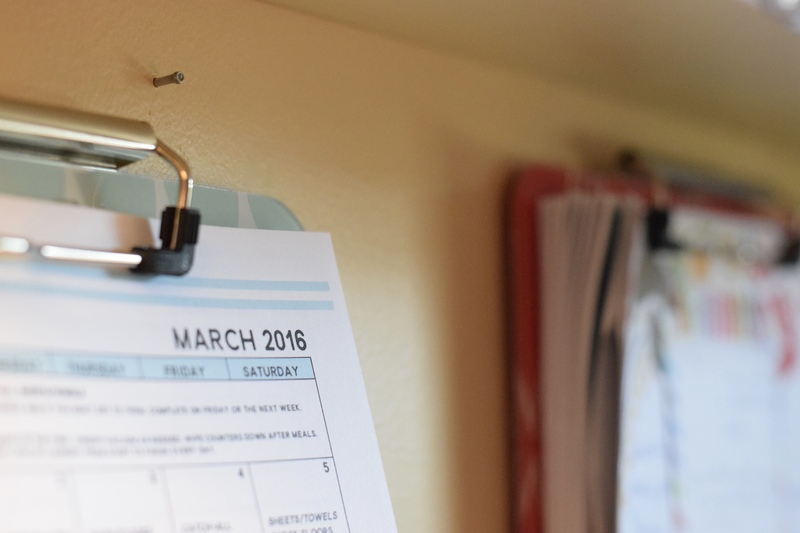 In fact, for the past few weeks I’ve had my Lenten calendar (source: Michele Quigley) attached to this clipboard for Lent. 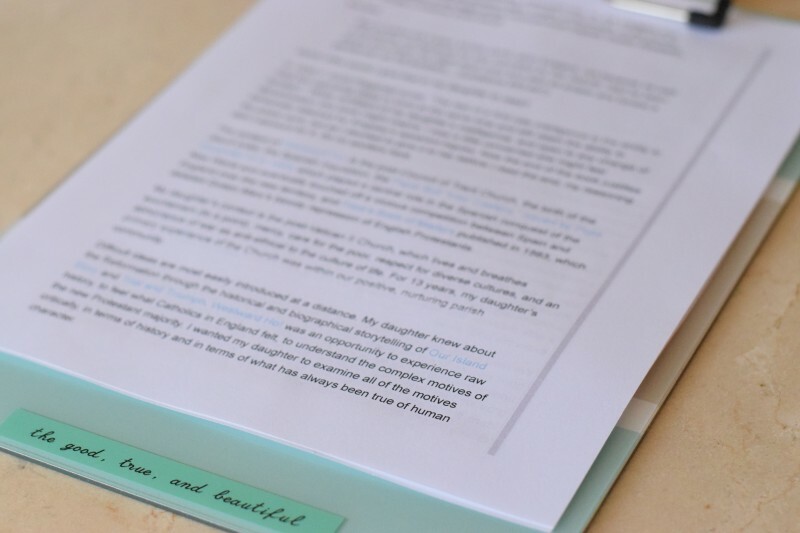 I attach articles I’ve printed, personal goal motivation print-outs, inspiring magazine pages I rip out, things I saved for the liturgical year that I want to incorporate or consider. I labeled the front: the good, true, and beautiful with my labelmaker. My red prism clipboard is my blog clipboard. I like writing about the things that YOU ask me about – the things you want to know more about (ergo, this post)! So…if you’ve ever left me a comment or emailed me and asked me to write about something in particular, I list it here. I have…ahem…several pages of requests. 🙂 I work on organizing your requests and brainstorm them on my notepad here…and then I plan my posts for you in draft. And I keep design/technical notes here, too. So…this is my working blog clipboard! My paisley clipboard is for personal projects. Right now, it’s a landing zone for brainstorming notes about two conferences I’m speaking at this summer! I’m speaking in Kansas City this June – talking about Morning Baskets, Planning, and Rebuilding Culture! Doesn’t that sound inspiring?! I’d love to meet you, Kansas City! And I’m speaking at the Grace Gathering Conference in Grand Rapids, Michigan in July – topics are still being funneled, but I know they’re going to be amazing based on some early brainstorming! I’m excited about both conferences and I always treasure meeting up with y’all when we can! So this clipboard keeps my ideas and notes for my speaking engagements together, talks which I’ll be building in earnest over the next few months. My pool blue scales clipboard is soooo pretty! And refreshing! So I keep all my home-making lists here. Pictured above is the free come-clean March calendar at cleanmama.com. If I find a DIY cleaning product recipe or an organizing list or strategy online, I add it to this clipboard. I also keep the kids’ master chore lists here. It’s super handy to check it and get started when I can claim 15 minutes to swish something tidy, and it’s especially handy if it’s a day of targeted cleaning or organizing! Yep, this is the token non-glam shot! LOL! Everyone wanted to know how in the world I got those clipboards to hang above my desk! Are you ready? Wait for it………………nails. These clipboards have another feature I LOVE! The back of the clipboard has a fixed hole that fits right over a nail. Have you ever had a clipboard with a little sliding (up and down) metal piece that could hold the clipboard on a nail? I have. And as nice as they are, that sliding piece is so annoying as you reach behind the clipboard to hold the metal tab up, while you position the clipboard over the nail, and try not to get your fingers in the way…but you slip and the tab slides back into the clipboard and you have to repeat this a gazillion times over and over again. sigh. I’m just sayin’. 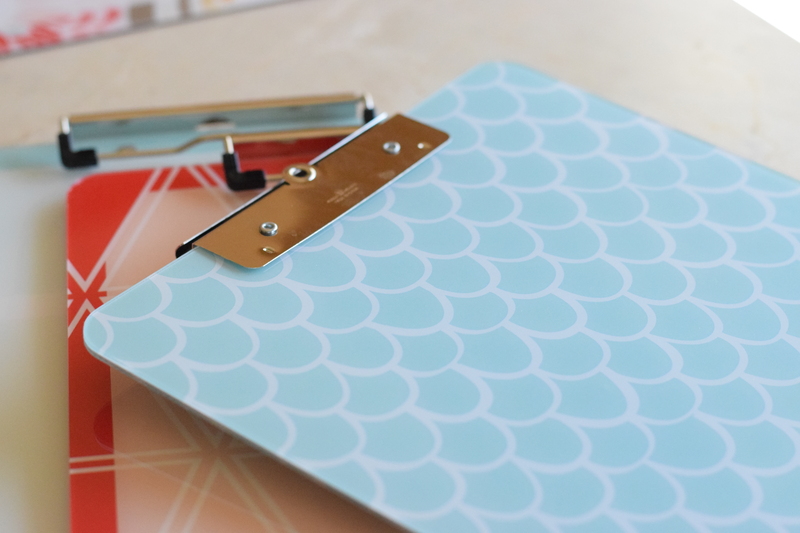 Fixed nail-hanging-hole-tab-on-the-back-of-your-clipboard….consider it. …and you’ll get $10 off an order! 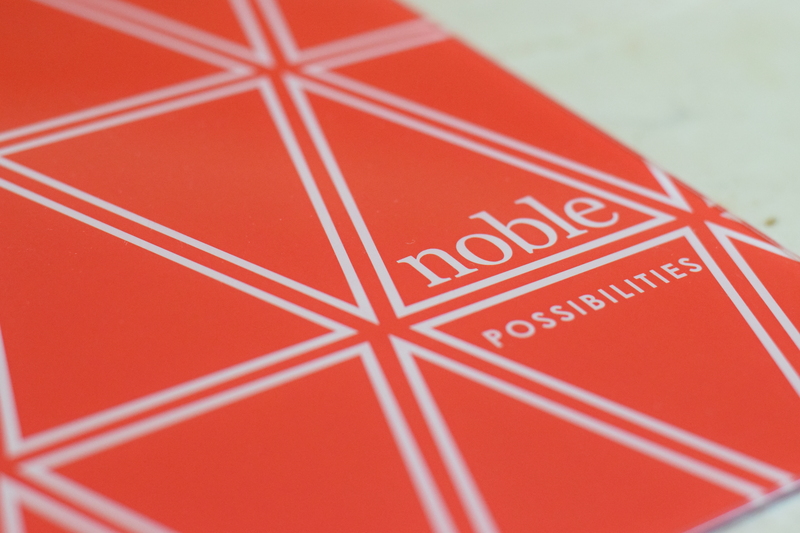 So…a little news – what’s coming soon? Be sure to subscribe so you don’t miss any posts! I plan on giving away one of these acrylic clipboard beauties before the next school year starts so you’ll want to watch for that! And…a little more exciting news! Erin Condren is going to let me have a few sneak peeks at some of her new products so I can share with you, review them, and I’m certain there will be some give-away opportunities for you there! I cannot wait to share some of the new products they’re rolling out – it’s the same beautiful-customized-married-to-practical that I love! Did you check out the EC blog? I have the next post in the planning follow up series almost ready to go! I’ve had a request for a detailed post (or set of posts) showing you how I organize our home library. Interested? I’m working on that! And several of you are thinking about high school and you’ve been writing and asking for some homeschool high school thoughts! You’ve got lots of questions and great requests – yep, got that series in draft, too! Lots of great stuff for you here at Wildflowers & Marbles! See you all soon! Love the pictures of the clipboards although I don’t have one (yet) and LOVE EC!!! Glad to see they hold so much paper. Might have to put this on my wishlist. I have a $25 credit to use with EC but haven’t decided what I want to do with it yet. It IS hard to decide how to spend a little gift certificate money!! They’re about to roll out some pretty new products – I think there will be something new each month! You’re coming to Kansas City!!! I’m so sad. This is the first year I won’t be at that conference! I’ll be at CMI. I would have loved to have met you! Oh, I’m so sorry I’ll miss you, Dianna!! Maybe another year! Have a fabulous time at CMI! 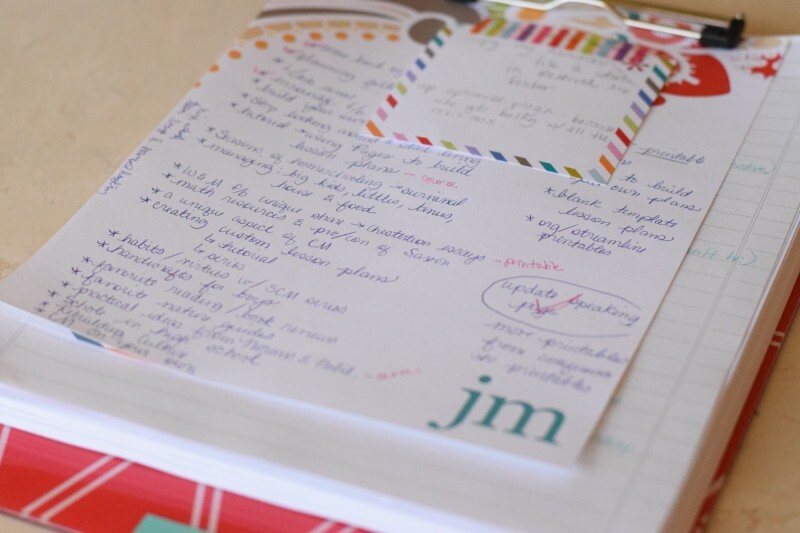 You do inspire me to get a little more organized, Jen! A clipboard is SO much less pressure than a planner! Also, did you think you could get away with not letting us know the name of your fab spring nail color??!! Your posts are a bit “If You Give a Mouse a Cookie”… we always want to know a little more!! Lol!! I can’t wait to see the new EC stuff! Take care! You are so right, Judith! 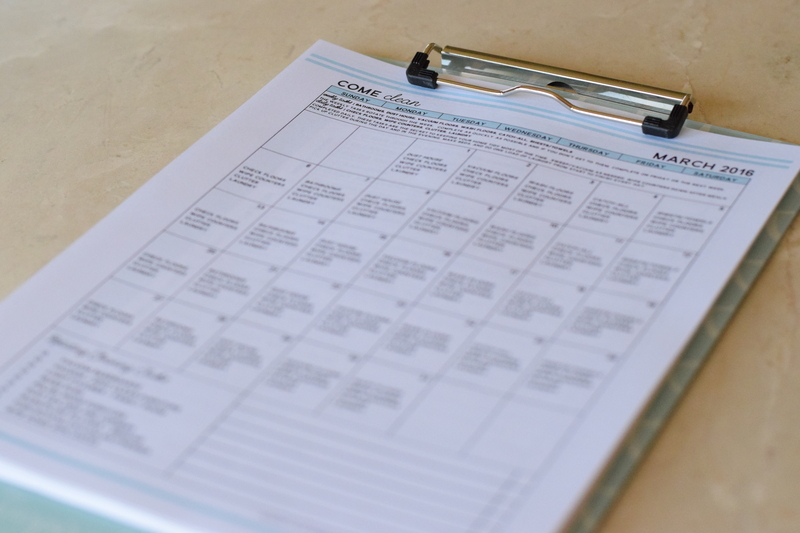 A clipboard is WAY less of a commitment than a planner! It would be a great start if you’re more of a pile person, too! 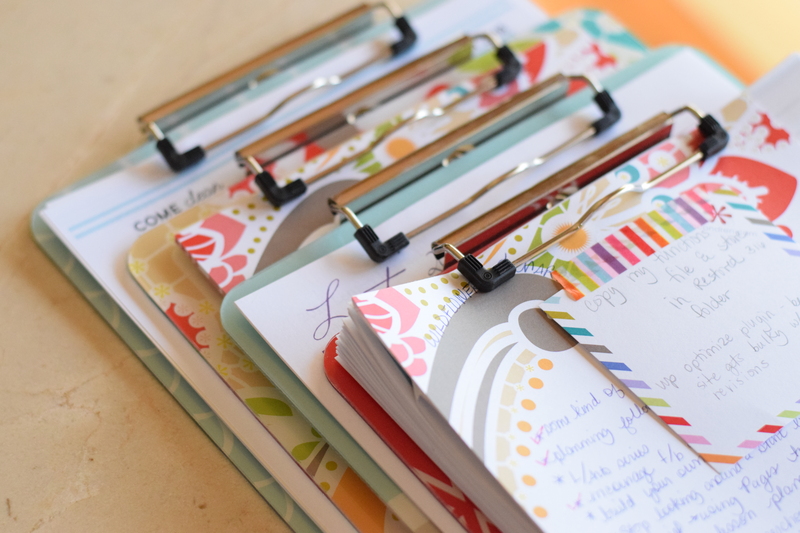 I’m kind of a toss up between a pile-er and a file-er…so my clipboards tackle the piles! Isn’t that a super cheery spring color?!?!?! 🙂 It’s Zoya nail polish in Eden – a pretty spring pink!!! I’m a huge fan of Zoya nail polishes! If you sign up for an account you’ll get emails that let you know about really good sales! Oh my goodness! I’ve kept checking the Kansas City conference site to see who was coming and…..nothing. What a wonderful surprise to read this post today and find out it’s you….totally worth the wait!!! I’ll be there! Most excited to meet you!! Yay, Lindsay! I can’t wait to meet you!!! See you in June! Hooray! I was a little burnt out on conferences but can’t wait to see you in KC! I enjoy your practical, beautiful approach to life. Thank you so much, Sarah! I can’t wait to meet you this summer! Thank you for showing us how you use clipboards. 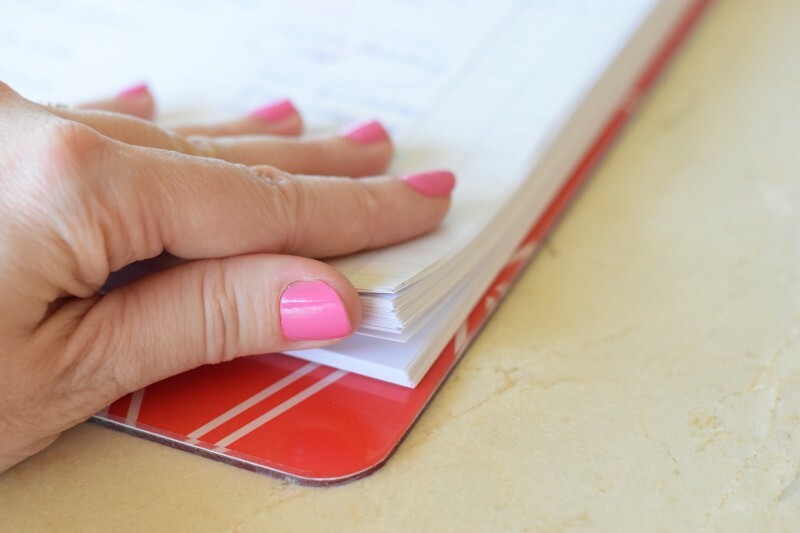 I have always had difficulty organizing paperwork such as you mention…and now I know what to try! You are an inspiration, Jen. I just came from your instagram and my jaw dropped when I saw your teal rolling cart in your planning shot. I have been looking for one of those for a long while. Do you mind sharing where it is from? Thanks again! Thank you, Mary! 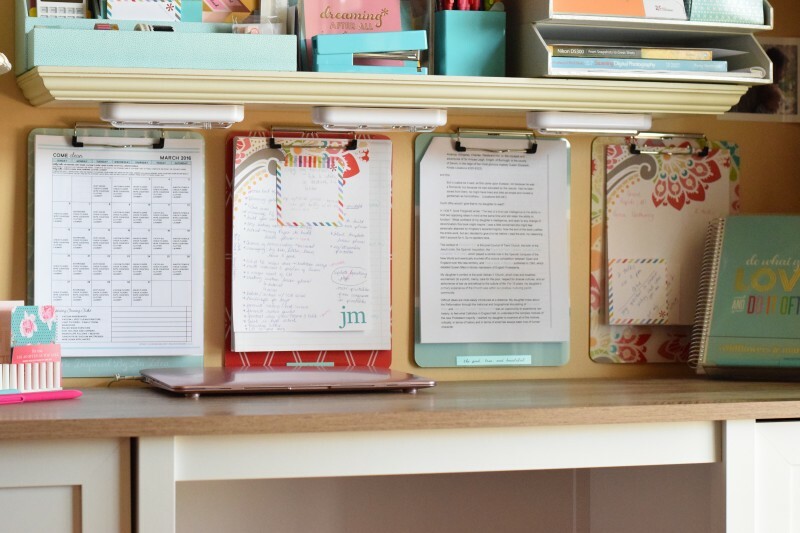 I find the clipboards are a great way to have a hanging “pile” of paper…which is always better than horizontal stacks of piles for me! The teal rolling cart came out of the dumpster! LOL!! Seriously! My dad teaches at a small liberal arts college and they must have been cleaning things out and Dad rescued this extraordinary little treasure from the dumpster. I asked to borrow it one summer to help me as a little mobile cart to help with planning and working with books and mom and dad brought it and gave it to me. 🙂 It is a HUGE help! You can still find them very affordably on Craigslist or local flea markets. They’re also available at library supply websites, too, if you want to look for something new. And can’t wait to meet you in person in Grand Rapids this summer!